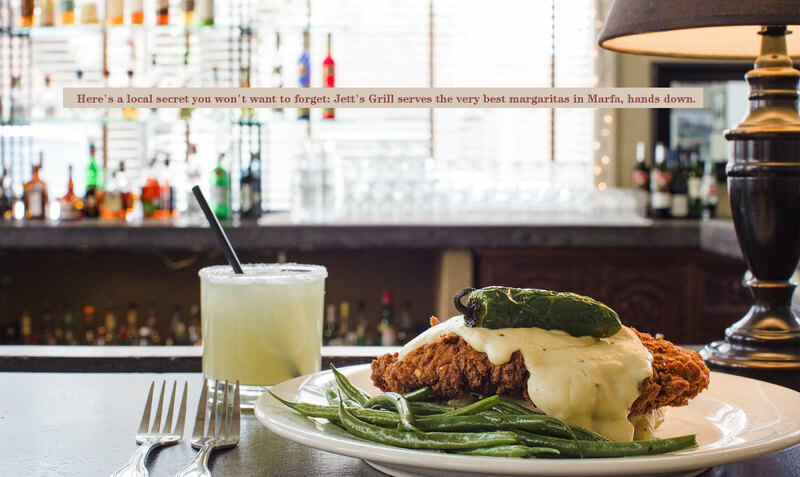 Mainstays of the Jett’s Grill menu include the pistachio-crusted sirloin steak and Black Angus GIANT burger. A lighter fare of seasonal salads and appetizers is always available, as well as fresh-made desserts. Jett’s Grill offers a full bar with extended weekend hours. Relax in the sumptuous leather furnishings of the lounge area, enjoy your drink and conversation in front of the historic fireplace or gather around the fire pit or the fountain and take in the sky full of stars on Marfa’s favorite patio. Reservations are recommended by calling 432-729-3838. Arrangements for private dinner parties may be made through the restaurant manager.